RA usually affects many corresponding joints on both sides of body. (For example, both knees, both ankles, both wrists, and the same joints in both hands may be affected.) Research indicates that almost all the joints that will be affected show symptoms of RA in the first year of the disease. This means that each joint may continue to get worse, but you probably won't have many more joints that will develop the symptoms of RA. Most people think of RA as a disease of the joints, but it is actually a systemic disease--it affects the whole body. That means that RA can show up in other organs, too, such as the heart, blood vessels, lungs, and eyes. Sometimes RA occurs in joints and other organs, and sometimes it occurs only in other organs. RA works somewhat differently outside the joints, but the underlying problems are still damage to the tissue and loss of function. No one knows exactly what causes RA. There are probably different causes in different people. Many doctors and researchers think that a virus or bacteria might cause RA. So far studies haven't proved this. However, researchers do know that bacteria can cause swelling in the synovial membrane. Heredity--your genes--plays a part in RA. The disease tends to run in families. If a close relative has RA, you are 16 times more likely to develop the disease yourself. 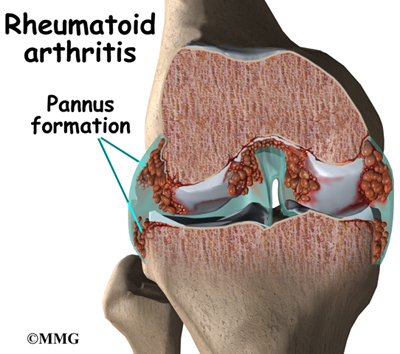 About half of RA patients have rheumatoid nodules. The nodules are hard knots, from the size of a pea to the size of a golf ball, that grow under the skin in three distinct layers. They are usually found on the outside of the elbow, the Achilles tendon on your heel, the underside of your fingers, the lower abdomen, and certain toe joints. They look like the kind of bump that grows around a splinter. They don't usually hurt. Over time they tend to shrink or disappear. Conjunctivitis, or inflammation of the eye, is common. It may be related to a disease of the eye called Sjogren's syndrome, which often occurs along with RA. The main symptom is eye dryness, but patients often can't even feel it. Cervical spine (the neck): Symptoms include neck stiffness, weakness, and loss of motion. Other symptoms often can't be felt or seen in exams. Ligaments are often inflamed, and there may be problems with the spinal cord or nervous system. Neck pain alone tends to get better, even when the joints are damaged. Damage to the nervous system does not usually improve. Shoulders: The main symptom is loss of motion. Your body's unconscious reaction to shoulder pain is simply not to use your shoulders. Since daily life doesn't require much shoulder use, frozen shoulder syndrome can set in quickly. Knees: It is easy to feel the swelling in the knees. A fluid-filled lump called a Baker's cyst often appears behind the knee. It can burst and leak fluid into the calf. The progression of RA is hard to predict. The swelling of RA flares up and dies down, and milder forms of the disease often don't require much treatment. Mild RA may even go undiagnosed. No single test can confirm a diagnosis of RA. Many findings over a period of time lead to the diagnosis. In fact, your doctor can't even positively diagnose RA until you've had symptoms for at least several weeks. Early on, many characteristics of RA haven't developed yet, such as the pattern of joints that are affected, X-ray findings, and blood test changes. And RA in its early stages can look a lot like other forms of arthritis, such as lupus, psoriatic arthritis, and diseases of the spine. Your doctor will need to consider each of these diagnoses and perhaps do tests to rule them out. Every patient with RA has inflammation of the synovial membranes. Your doctor can confirm this by checking the count of white blood cells (WBC) in your synovial fluid. This involves inserting a thin needle into your joint and drawing out a small amount of the fluid for testing. The fluid can also be tested for other things. The WBC alone doesn't prove that you have RA. Your doctor will need to rule out other causes of synovitis. Your doctor will also ask you to undergo a blood test. RF, or rheumatoid factor, is found in the blood of about 85 percent of RA patients. But this test alone can't confirm RA either. Some patients with RA do not have RF, and people with RF can have other forms of arthritis. Doctors have learned much about RA in recent years, but they still don't know much more about how to truly cure the disease. They do have many strategies for treating the symptoms of RA. If you start treatment within a few months after your symptoms appear, the better you will probably do in the long-term. Early detection and treatment can help avoid the worst joint damage. Sudden remission does occur, but it's unclear how often, and it appears to be more likely within the first two years of the disease. Patients who develop RA at a young age, are RF positive, have close relatives with RA, and have RA nodules tend to have a more difficult time managing the disease. Penicillamine is only used in patients who have systemic disease that doesn't respond well to other medications. Combining methotrexate with another drug to get the desired results (decreased joint pain, swelling, and stiffness) is a popular and effective strategy for many patients. One group of disease modifying medications used along with methotrexate is called anti-tumor necrosis factor (TNF) agents. Another term for the anti-TNF agents is TNF inhibitors. These are a special type of antibody also referred to as human monoclonal antibodies. They specifically target (and inhibit) tumor necrosis factor. Tumor necrosis factor (TNF) promotes the inflammatory response, which in turn causes many of the clinical problems associated with autoimmune disorders such as rheumatoid arthritis. Anyone taking tumor necrosis inhibitors must be careful to report any signs of infection to the physician right away. There have been reports of deaths possibly associated with unrecognized or untreated infections in patients taking these immune suppressing drugs. Symptoms of infection anywhere but commonly affecting skin, lungs, or urinary tract include fever, chills, fatigue, enlarged lymph nodes, skin rash or red streaks, cough, and/or sore throat. Upset stomach, painful urination or blood in the urine or stools are additional important symptoms that could be a signal of infection and should be reported to the physician as well. At least half of RA patients don't find much relief from treatment and eventually need surgery on the affected joints. Surgery, including total joint replacement, can be a very effective way to help you overcome the pain and loss of movement of RA. For most patients, RA is a disease that comes and goes throughout their lives. But it doesn't have to be crippling. With your doctor's help, you should be able to find treatment that works for you.